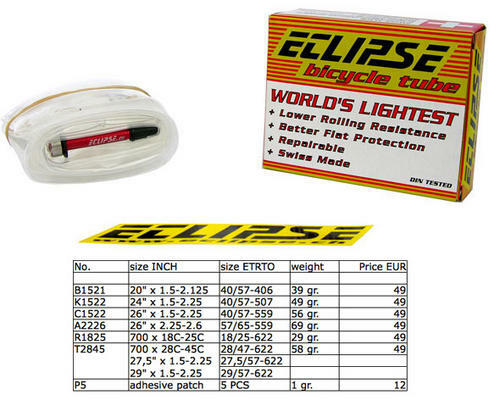 Eclipse Tubes anyone tried them yet ? Discussion in 'Downhill & Freeride' started by al-irl, Jul 17, 2013.
at 49 a tube even at trade prices these will be an expensive experiment so Im wondering if any of you Monkeys have tried them out and if so how did you find them ? No troll here. But wasn't there just a thread on these? It had some more information on them and if I remember correctly, someone posted about using them. A tube that costs the same as a tire, so you don't have to buy a new tire? Doesn't sound like a wise investment unless they're impossible to flat. I just use super-glue on holes that Stans won't heal, never let me down, and never had to toss a tubeless tire due to a hole. 49euros?? Is it self inflating? That goes along nicely with the $80 DH tires out these days. Oh and the $1100 machine built wheels! I may hit them up and try out 2. I tried emailing the distributor awhile back and never got a response. BTW, I tried the cigarette lighter method to repair a puncture. It worked OK two out of three times, and in the last attempt the darn tube caught fire... I'm using their self-adhesive patches ever since. Are you talking about the FOSS tubes? If so, a couple of recommendations: if you get a puncture, DO NOT OVERINFLATE THEM to find it. They are made of a much more dense material, which helps them to close the puncture around the object which caused it, but that very material makes them not as elastic as plain old rubber. If you overinflate them out of the tire they will stretch and deform. Also, pay attention to where should the gluing be in relation to the wheel's rotation direction. yes, I ordered the FOSS ones. Thanks for the tips. i was gonna say something about how expensive these are, until i saw that they wanted 15 bones for some patches! jeez! I patch holes in tires with stand tube patches. Same process you'd use for a tube but after applying the patch inflate a tube in the tire for a while to press the patch on. they're ment to be impossible to flat but I was wondering how true that was. If they live up to there reputation having one in the back could be a big advantage for me especially when racing. Nothing feels like burning money like a race ruined by a puncture.